This link has a great description of how to prepare the meat, and mentions that you can use many different seasonings and marinates according to your taste. When Michael was a teenager living in Arizona, a group of men from the church went elk hunting and brought back more meat than they could use. They distributed it around to church members and Michael’s mother decided to make jerky from some of it. Apparently she made a LOT of elk jerky. He is a little fuzzy on the details but is sure she cut the elk meat into strips. She then used Italian dressing (not a sweet kind) and dried jalapeno peppers as a marinate. (Go LIGHT on those jalapenos. I’m warning you). She marinated it overnight. She put the marinated strips on racks in a toaster over at the lowest setting and let it cook until it was dry. It must be on open racks so air can get all around it. An average oven cooks at too high a setting. It will take several hours for the strips to dry into jerky. 200 degrees seems to be about the right temperature, and 5-6 hours seems to be the right time. You can leave the door cracked, as the instructions linked above say, and taste-test often after you hit the five hour period. I’m sure that won’t be a big sacrifice for your taste-tester. I know, the picture below is of Beef Jerky, but hey, it’s astronaut food! I couldn’t resist! The Conflict of the Ages is a Multi-Part exploration of History, Science and Ancient Literature. This first installment covers the concepts of God, time, Creation, physics, cosmology, ans specifics about each day of Creation. We make comparisons with ancient sources to see where they agree with the Scriptural account. We reference classic and modern scientific views, exposing errors, preconceptions, presuppositions and falsehoods taught as fact by the mainstream scientific community. God is the first witness and the Bible the first eyewitness account of beginnings and origins. Other ancient documents contain at least some truths and parallel accounts. A Northerner married to a Southerner gets enough stares and scorn. Carrie doesn’t need more from Robert Salliger, handsome friend of her dying husband. He says Ben’s death is his fault. He swears to take care of Carrie and the children. But she goes home alone, and can’t read the letters that come. When a deaf and dumb boy arrives she is glad for the help but has no idea how much help he will be. An English Knight begins a diary of his “adventure” joining Louis IX’s First Crusade. The armada to Alexandria encounters a violent storm and the knight and his companions shipwreck. He must make an impossible choice: Cut himself off from his people or face execution. His life of turmoil and terror leads him to peace, but slavery and torture block his quest to find his friend and get home to his father. Are you stressed? Anxious? Tense? Fearful? In 1 Peter, we’re told to cast those feelings on Jesus. Over the next two Saturdays, let’s dig a little deeper into this verse and the word anxiety. Dictionary.com gives this as one definition for anxiety: earnest but tense desire. See anxiety isn’t always coupled with fear. Sometimes it is tenseness over too many things coming your way. You feel like you can’t take one more thing—not because everything is bad, but because it’s just too much. You may earnestly desire that promotion at work or the news that you’re finally going to have a baby. These are good things, but when we’re tense even about the good things, it can draw our attention away from God. We begin trying control the situation to get the outcome we want. This is what harms us. We are trying to take control from God—the creator of the universe, all powerful, all knowing God. Instead, he tells us to “cast all your anxiety on him.” Sometimes I think this is hard for us to picture. We generally don’t see casting (throwing things) as a good thing. I like the word “chuck” better. Think of a time when you were really angry. Maybe you chucked the TV remote across the room, or perhaps you just thought about doing it. Why can we actively chuck our anxiety on God? 1 Peter 5:7 gives us the answer to that question as well. He cares for us. He will glad take all of the anxiety we hurl his way and absorb it into himself, whether it’s the earnest and tense desire type of anxiety that we discussed today, or it’s the distress caused by fear or danger that we’ll discuss next wee,. So, get ready. Wind up your pitching arm. On the count of three, cast your anxiety on Him. One. Two. Three. Yep. He caught it, even if your aim was a little off, because he cares so much about you and for you. Karen Baney writes Christian historical and contemporary romance novels. When she’s not busy writing, she enjoys traveling the state of Arizona with her husband, exploring museums and the picturesque landscapes the state has to offer. Her faith plays an important role both in her life and in her writing. Karen and her husband make their home in Gilbert, Arizona, with their two dogs. You can pick up a copy of Karen’s book, A Heart Renewed (Prescott Pioneers #2), on Amazon for your Kindle. This amazing story of forgiveness and healing takes readers on a journey filled with pain, hope, and love. Visit Karen at her website: http://www.karenbaney.com or on Facebook or Twitter. Visit her special blog for authors at http://www.everythingauthor.com. Whenever I read how the scientific community explains the plagues against Egypt described in Exodus, I have to giggle. They have a logical explanation of how each plague happened through nature, through natural process, then they reach the conclusion that because the plagues happened naturally, there is nothing miraculous about them. There is no God. The ancients just created a god to explain what they couldn’t through their limited knowledge. In other words, the scientists jump to the wrong conclusion. They just don’t get it. Whether or not it’s true that the plagues were natural phenomena, I don’t know. But even if it were true, it would prove there is a God, not the other way around. The God who created all has all of creation at his disposal for his use. Of the multitude of lessons one could learn from this episode in history, the top of the list is that God uses his creation for his purpose–which is usually to get our attention. This truth is why we should pay attention to the changing weather patterns, the increase in earthquakes, fires, and hurricanes, the beaching of whales and dolphins, and the host of other oddities, caused by both nature and governments, that seem to be galloping toward us like an angry Quarter Horse. Christians are required to watch, to recognize the signs of the times we’re in. “Learn this parable from the fig tree: When its branch has already become tender and puts forth leaves, you know that summer is near. So you also, when you see all these things, know that it is near–at the doors” (Mt 24:32-33). Because we don’t know when he’s coming back, we’re required to watch and to be prepared, with our “oil lamps” full. He tells us in his word what to watch for. The Pharisees and Sadducees of his era were supposed to be watching for him. Those who made a career of studying the Scriptures should have recognized him and received him joyously. Instead, they asked for a sign. Remember what he said? “When it is evening you say, ‘It will be fair weather, for the sky is red;’ and in the morning, ‘It will be foul weather today, for the sky is red and threatening.’ Hypocrites! You know how to discern the face of the sky, but you cannot discern the signs of the times” (Mt 16:2-3). It’s time to watch. Time to pay attention to the signs. Time to refill your oil lamp. Perhaps what we’re seeing today is just “the beginning of sorrows,” or perhaps it’s the escalation of “birth pains,” but because we don’t know the day or the hour, we must remain in a state of preparedness. Linda wrote this post for us as part of her first anniversary promotional campaign and giveaway for her novel, Give the Lady a Ride. In this contemporary western romance, the main character, Patricia Talbert, is a Christian who needs to return to her first love. Linda cleverly arranges for the reunion to occur on the back of a bull. Although the story is fiction, the fact that God welcomes all his prodigal children home with open arms isn’t. To learn the rules of her giveaway, visit 777 Peppermint Place, then come back and leave a comment to be eligible for the drawing. Linda Yezak lives with her husband and three cats in a forest in Texas, where tall tales abound and exaggeration is an art form. She is a two-time finalist in ACFW’s Genesis Contest, in 2008 for Give the Lady a Ride, a contemporary western comedy romance, published in 2011, and in 2010 for The Cat Lady’s Secret, a Women’s Fiction comedy-drama. She has been published in Christian Romance, Beyondaries, and Vibrant Nation e-zines, has served as a judge in several national and local writing contests, and is currently a freelance editor and a consulting editor for Port Yonder Press. My love for writing met my love for youth about two years ago and formed an inseparable bond. For approximately six years, I worked with my church youth department helping to mentor and lead teens. When I decided to take my writing seriously, teens found their way into my books quite naturally. I will never stop writing for teens or young adults. They hold a special place in my heart because I’ve seen their daily struggles. Several times society has written off those who seem to be going astray instead of reaching out to them. My goal is simply to reach out a hand through my writing. Biography: Joana James is a young Christian author from the island of Saint Lucia in the Caribbean. She is an I.T. professional by day but in her free time she escapes from the logical world of technology into the artistic world. She is an avid reader and her kindle is her favourite piece of technology. Music is her best friend and that manifests itself through her love for dance and singing. 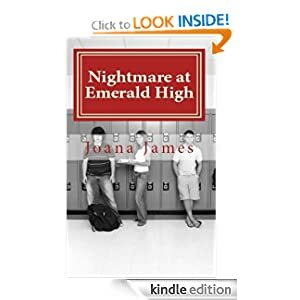 Book Synopsis: Malcolm Drake is one year away from the end of high school when a tantalizing scholarship offer comes his way. Malcolm and several other classmates eagerly join a program called Alternative Science that promises to open their minds to new ways of thinking and of course, help them win that scholarship. Little do they know that this program would change their lives forever. The class is riddled with eerie séances, encounters with spirit guides and a slow desensitization of the teens towards everything evil until they become completely entangled in the world of the occult. With the program being run by the town’s most influential people, the kids have a hard time getting out. Things take a turn for the worst when Malcolm is summoned to his school where he is bound and drugged in an effort to convince him to remain in the program. Will good prevail over evil? Purchase links:http://www.amazon.com/dp/B006HMJQQ4 Available both in ebook and paperback format. The book covers the formation of the Revelation Special Ops, the “Elite of the Weak” of the title. The name comes from I Corinthians 1:27, God using the weak to confound the mighty. Weak also means meek, and the team’s mission is to create servants of God who combine the best of humility and strength for the task. The way they respond to the expected and unexpected situations in which they find themselves is very impressive. I liked the fact that members and trainees range in age from Hadassah, who joins around age seventeen, to others in their forties. I also liked the fact that this book is filled with Scriptures and prayers, as well as danger and adventure trying to locate and rescue kindnapped family members and others. Hadassah’s amazing and unintentional “dry run” in Africa proves her mettle, though all the members bring skills, plus the need for further training, to the team. My favorite character was Hadassah’s mother. I want her on my side in a crisis, and every day, in fact. 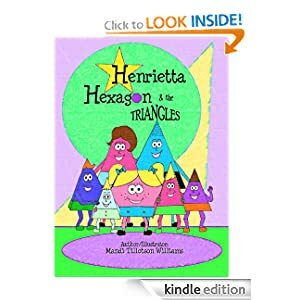 My kids are all in their twenties, but I have been a teacher, homeschooler and mom so I feel qualified to comment on this clever and fun children’s book. It deals with adoption and “fitting in,” and when you are a shape, that’s more than just an adorable pun. My husband and I were stuck at a Verizon store for quite awhile trying to get our aircard fixed. A man was there trying to get his account straightened out and also manage his two small girls. I was so glad I had this book on my Kindle Fire to show them. They enjoyed it (at least the one who could talk did) and I know other children, parents and teachers will as well. It’s a wonderful storybook cleverly written and illustrated.